A Fox News Reporter says the network punished her when she complained about discrimination. Now the Equal Employment Opportunity Commission is suing — but Fox calls the suit "suspiciously timed." 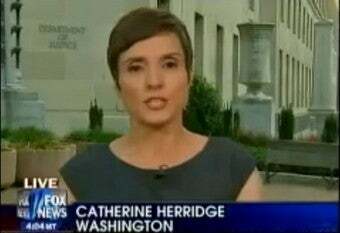 According to Politico's Keach Hagey, homeland security reporter Catherine Herridge — apparently called "the terror pixie" by some — complained in 2007 of discrimination for her age and gender. Amanda Hess of TBD writes that Herridge also alleged that "female and black correspondents were given less desirable shifts." The next year, Fox gave her a contract that referred to her complaints, and stipulated that she wouldn't become an anchor or co-anchor while it was in effect. She wouldn't sign, and so became an at-will employee for the next nine months, causing her "considerable stress." Now the EEOC is suing Fox, claiming that the restrictive contract was a retaliation for Herridge's complaints. Says Lynette Barnes, an attorney for the EEOC, "What our lawsuit alleges is the she complained internally of age and gender discrimination, and those complaints are covered by our statutes. You cannot be retaliated against for making internal complaints for age and gender discrimination." Of the lawsuit, Fox has said, "We're not going to respond to a suspiciously timed press release from the EEOC." Hess says Fox wouldn't clarify this statement, so it's not totally clear what they mean by "suspiciously timed" — but perhaps they're claiming that the EEOC is trying to discredit them in advance of election season. Hess notes that this isn't the first time the EEOC has sued Fox — in 2005, it sued on behalf of Kim Weiler, who complained that her male supervisor used obscene language to refer to women, and once said that in hiring, "If it came down between a man or a women, of course I'd pick the man. The woman would most likely get pregnant and leave." Weiler said that when she complained about comments like these, she was fired. Fox eventually agreed to pay $225,000 in a settlement, and did not admit wrongdoing. And then of course there was the sexual harassment suit against Fox host Bill O'Reilly — producer Andrea Mackris alleged that O'Reilly made repeated lewd phone calls to her, at one point describing how he'd like to massage her naked body with a loofah mitt, which he called "the falafel thing." When she asked if he was worried about women he'd harassed coming forward, he allegedly said, "If you cross Fox News Channel, it's not just me, it's [Fox president] Roger Ailes who will go after you...The person gets what's coming to them but never sees it coming." Mackris's suit was eventually settled, likely for millions of dollars, and O'Reilly told viewers there was "no wrongdoing in the case whatsoever by anyone." Still, given Fox's history, it's the network, and not the EEOC, that looks "suspicious."